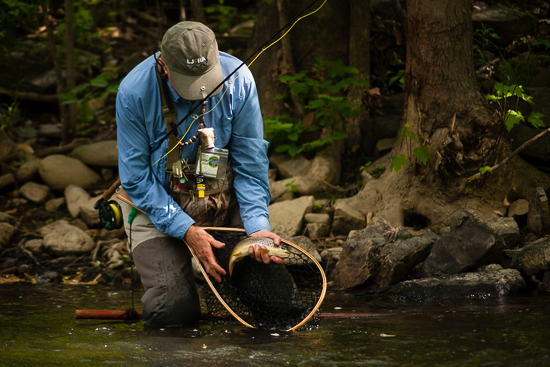 Bill Anderson, President of the Little Juniata River Association, catches a 15-inch wild brown trout in the Little Juniata River in Blair County, Pa., on May 19, 2015. The Little Juniata River Association has secured roughly five miles of permanent fishing access with help from the Pennsylvania Fish & Boat Commission, and has implemented restoration projects to reduce sediment in the river. A long history of pollution from municipal sources, nearby tanneries and a paper mill had degraded the river into what Anderson calls a “dead stream.” And after a mysterious pollution event in 1997 destroyed much of the waterway’s aquatic insect and invertebrate population—essentially starving the brown trout—the community had had enough. “We never determined the cause. But several local people got together who loved the river and decided that wasn’t going to happen again,” says Anderson, current president of the nonprofit organization that emerged: the Little Juniata River Association (LJRA). 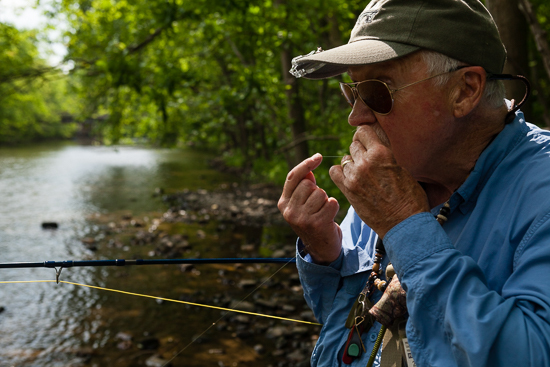 Anderson attaches a fly after snagging his line while fishing the Little Juniata. 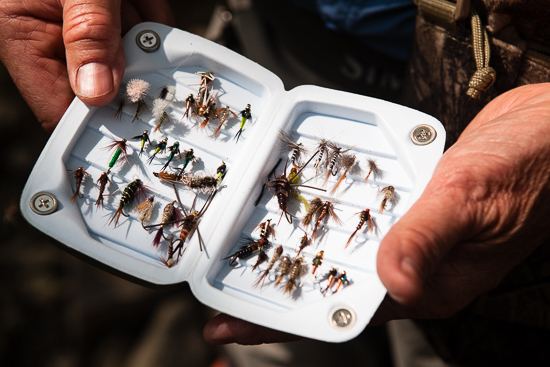 He uses different lures based on what the fish are eating, which he determines by sampling the macroinvertebrates living in the water. For a handful years after its foundation, the LJRA sat dormant: most of the few dozen members had drifted away and meetings were infrequent. But in the decade since Anderson became its president, the group has transformed nearly as much as the river itself. 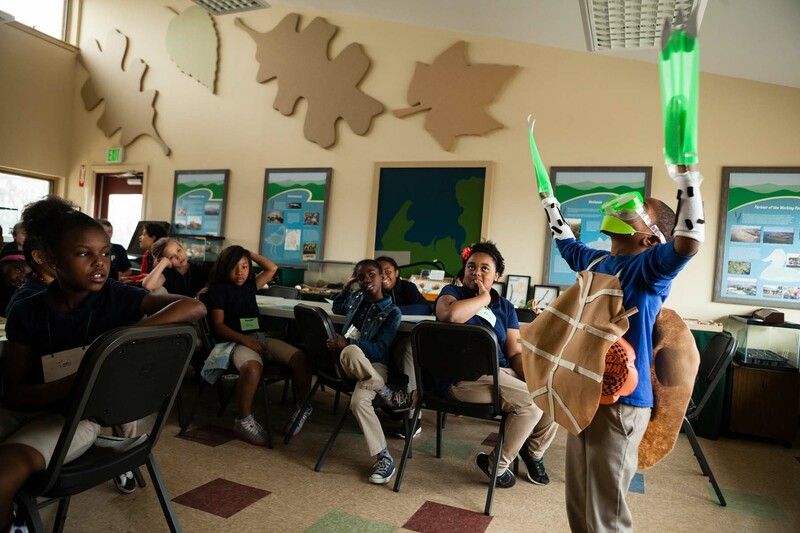 The purely-volunteer organization now boasts more than 200 members, and its mission includes not just monitoring of the river, but the improvement of the whole watershed. 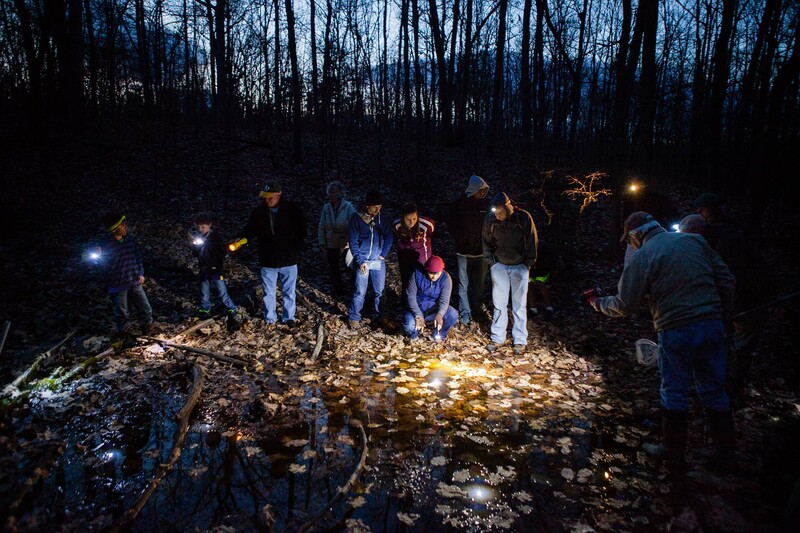 Activities range from restoring stream banks to protecting fish habitat. More than 1,400 feet of stream bank has been repaired to prevent excess sediment from entering the river, where it can block sunlight from reaching underwater plants and smother bottom-dwelling species. The nonprofit also hosts an annual trash pick-up, clearing 20 miles of riverbank of litter and debris. These days, the LJRA is focused on the future. With changing climate conditions come rising water temperatures, which can be devastating for the health of cold-water fish like brown trout. In association with Juniata College, the LJRA tagged 24 mature trout to determine where the fish go when water temperatures warm. “The idea is let the trout lead us to the places that need to be improved, and then we’ll set about improving those pieces and parts of the river, whether for spawning or for refuge from heat,” Anderson explains. 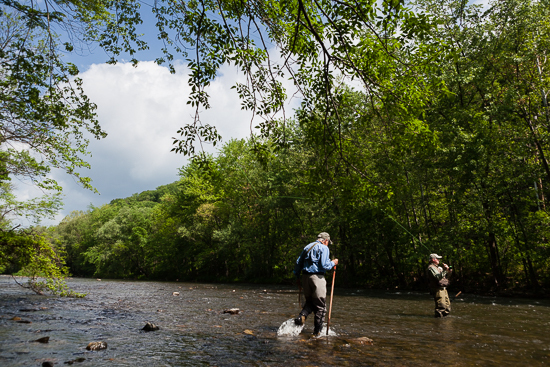 Anderson fishes with longtime friend John Norton in the Little Juniata River on May 19. 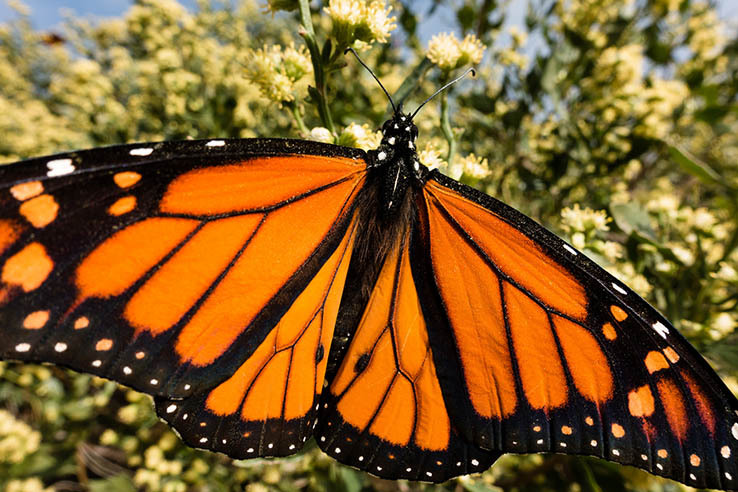 Wonderful story and photos… thanks for sharing! Love the idea of letting the fish ‘lead the way’ to the places they need us to restore/protect.